On July 1, 2016, the Local Municipalities will begin to accept, process and approve resident applications to the Halton Region Older Adults Property Tax Deferral Program . Designed to enhance the quality of life for older adult homeowners with low incomes, the program allows eligible participants to defer the full value of their annual property taxes. The deferral takes the form of an interest-free loan that lets participants focus their financial resources on their day-to-day needs, helping them manage the rising cost of living. By making home ownership more affordable, the program helps participants stay in their own homes and communities. When we began the planning stage for this new program in 2015, we set out to help older adults with low incomes manage the rising costs of home ownership with a full property tax deferral so they can continue to live healthy in Halton. Our homes are important parts of our well-being—they are a source of comfort, acceptance, pride and inspiration. Many of us have remained in the same neighbourhood for years, and have created fond memories in these spaces with our families, friends and communities. Halton Region is responsive to the changing health needs and overall well-being of residents, and this program helps deliver on our commitment to support good health at every age and stage of life. It will help residents stay healthy and independent by allowing them to age in places of their choice, in the homes they built with the people and communities they love. I would like to recognize the many individuals who helped make this fantastic program a reality, including the Local Municipalities and the Local Councils. The Local Municipalities were integral to the program’s creation, and now they will offer it to their communities by accepting resident applications and providing the deferral to participants. I am pleased to extend my deepest thanks to each of them for their invaluable support. By promoting healthy aging together, we help keep Halton a great place to live, work, raise a family and retire. To learn more about the Older Adults Property Tax Deferral Program, please visit halton.ca/taxdeferral. I am excited to announce that the Halton Older Adults’ Directory 2016-2017 is now available. This key resource is just one of the ways Halton Region continues to ensure all residents have easy access to the services they require – the directory has provided valuable information to older adults, caregivers and service providers since 1988.
includes several websites that offer more detailed information online. According to the Region’s Best Planning Estimates, the number of older adults (65+) in Halton will nearly double to 127,000 by 2031. Key resources such as the new directory help our residents connect to the services they need and ensure that Halton is responding to the changing demographics and diversity of our community. Residents can get a copy of the Halton Older Adults’ Directory 2016-2017, by dialing 311, visiting our website at halton.ca/oaac or in person at the Halton Regional Centre, located at 1151 Bronte Road in Oakville. In addition to the online version of Halton’s Older Adults’ Directory, the OAAC offers a number of other informative publications that can be accessed at halton.ca/oaac, including the new Housing Options for Older Adults in Halton. I encourage residents, including older adults, their families and caregivers to also visit our website for information about the Region’s long-term care homes, adult day programs and assisted living/supportive housing programs. Congratulations to the OAAC for the work they do each day on behalf of older adults in Halton. Thank you for helping to make Halton a great place to live, work, raise a family and retire. On Thursday, February 20, the members of Halton Region’s Elder Services Advisory Committee (ESAC) gathered together at the Halton Regional Centre to celebrate the launch of the 2014 Seniors’ Directory. The directory contains a comprehensive list of contact information for a range of programs and services available to seniors in Halton. It is a valuable tool that connects seniors, their families and caregivers in our community with services like housing, financial assistance and transportation. Providing seniors with services that support and contribute to a safe and healthy community is an important priority for Regional Council. With the province estimating the number of seniors in Halton will increase from our current number of approximately 66,000 to more than 130,000 by 2031, Halton Region is committed to ensuring quality services are in place to meet the needs of seniors now and in the future. Since 1988, the directory has served as a user-friendly reference guide that highlights the extensive range of services available to seniors in Halton. The latest directory has been enhanced to include links to web addresses where readers can access more detailed information about the services they need. I’d like to extend my thanks to ESAC for all they do to support seniors in our community and ensure that Halton a great place to live, work, raise a family and retire. I’m very proud to share that recently, the Region’s Services for Seniors and the North Halton Mental Health Clinic received accreditation with exemplary standing from one of the leading national accreditation organizations, Accreditation Canada. Completing accreditation means that Halton’s programs are measured against national standards of excellence. These standards examine all aspects of health care, from patient safety and ethics, to staff training and partnering with the community. Exemplary standing is the highest level of performance an organization can receive and AC has only given this standing to 20% of those they have surveyed. It’s an incredible achievement and shows our services not only met national standards, but exceeded them. The high rating from Accreditation Canada is also consistent with the high satisfaction rating we received from Halton residents. In recent polling, 97% of residents indicated they are satisfied with the overall services provided by Halton Region. Another achievement of which I am very proud. To find out more about Services for Senior and the North Halton Mental Health Clinic, or the many other services offered by Halton Region, please visit www.halton.ca or give us a call by dialing 311. Affordable and Assisted Housing is a priority in Halton’s Citizens’ Priorities 2011-2014 Action Plan. Providing housing supports to address the needs of low income residents is an important issue that requires commitment, investment and response from multiple levels of government and partnerships with community agencies. 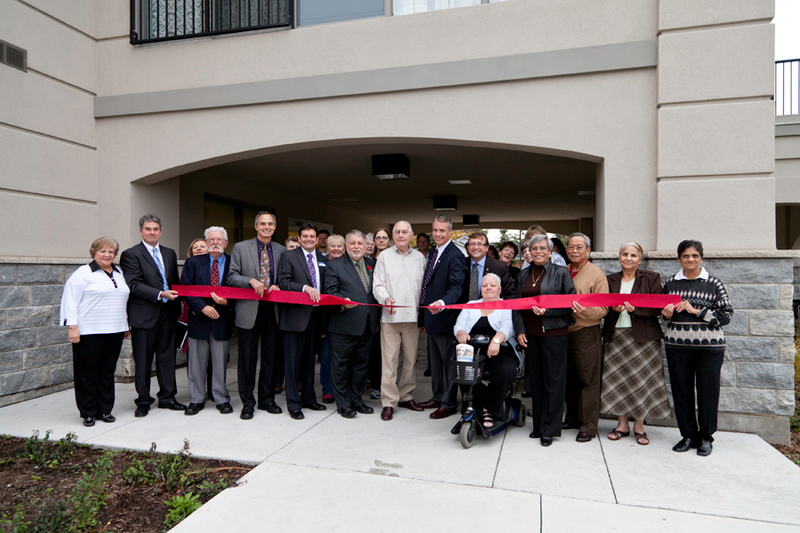 On October 19, representatives from all levels of government joined the residents of Aldershot Village Residence in Burlington for a ribbon cutting, tours and an official opening ceremony. On November 15 we will gather again to celebrate the official opening of Martin House Seniors Residence in Milton. Together these two buildings add 145 units of assisted housing for seniors to our community. Martin House Seniors Residence and Aldershot Village Residence are shining examples of how all levels of government can come together to meet the needs of our growing community. I had the opportunity to meet many residents of Aldershot Village and I’m very proud of the positive feedback they have about their new building and the sense of community that lives within it. Working together, we all make Halton a great place to live, work, raise a family and retire.